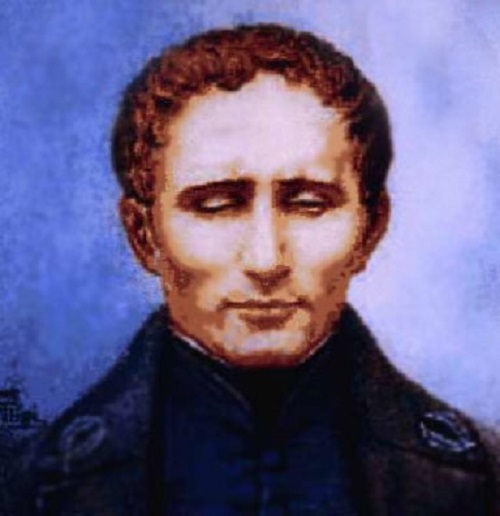 Braille was born at Coupray, France, on January 4, 1809. At age three, he was blinded by an accident in his father’s harness shop; an awl slipped and entered the boy’s eye. The injury eventually caused sympathetic blindness in the uninjured eye. Braille attended the village school and forged ahead of his classmates despite his handicap. In 1819, he traveled to Paris to continue his education at the National Institute for the Blind, and he began teaching there in 1826. alpha He also became renowned in Paris for his accomplishments as an organist and cellist. While a student, Braille became concerned about the limited reading and writing opportunities of blind people; he and his peers had access to only a few bulky books with enlarged, embossed letters. Braille began searching for a new printing and reading technique. He was inspired by Charles Barbier, a French army officer who had developed a system of raised dots and dashes for written communication on battlefields at night. Braille recognized that such a system had potential as a method of touch reading because it was simple and would fit within the span of the fingertips. In 1825 Braille introduced a new alphabet based on the “Braille cell,” a six­point unit similar to the dots of a domino. He assigned a different spatial combination of the six dots to each of the 26 letters of the Roman alphabet. He also designated dot values to numbers and musical notation. The Braille alphabet enabled students to read and also to write, by using a simple sliding metal rule with window like openings for punching dots out of thick paper. Braille wrote treatises about his alphabet in 1829 and 1837. Braille became ill with tuberculosis and died on January 6, 1852, in Paris. The Braille alphabet enabled blind people to read and write in an efficient manner—improving their education, opportunities, and acceptance in society. Braille’s system appeared more than three decades after the idea of writing in relief for the blind was first introduced. In 1793 Valentin Haèuy, the founder of the National Institute for the Blind, designed an enlarged italic embossed print. It was used, with some modification, until Braille introduced his dot­based alphabet. Braille’s system opened new doors for the blind. It enabled them to read and write and to rely on a standardized, widespread system of reading and writing. Blind people were able to study extensively, perform complex mathematical calculations, transcribe musical notation, and correspond with each other through the mail. The Braille alphabet allowed blind people to live more normal lives and to pursue careers and activities that would have been much more difficult without an education involving reading and writing. In the 1830s Englishman James H. Frere improved Braille’s alphabet by proposing the return­line system, in which one line reads from left to right, and the next follows from right to left, so that the finger does not lose its place between lines. The Braille alphabet came into widespread use outside of France after it was presented at the 1878 International Congress in Paris. In the twentieth century, technological progress was harnessed to produce a more extensive and more convenient library of books for the blind. The early books printed in Braille were so large and bulky that their practical use was limited. The modern Braille library is stored on a computer, and when needed, Braille text is transcribed from the computer onto tactile paper by a special printer.